" Sometimes one of the greatest delights of life is food! " During travel, it's nice to experience the culture and authentic cuisines found in different parts of the world. I went to Malacca town, Malacca, Malaysia few months ago for a two day trip. It was an exciting food tour. I got to try some of the town 's specialty. Had a quick lunch in the afternoon. We had prawn noodles at the town center. A little spicy. 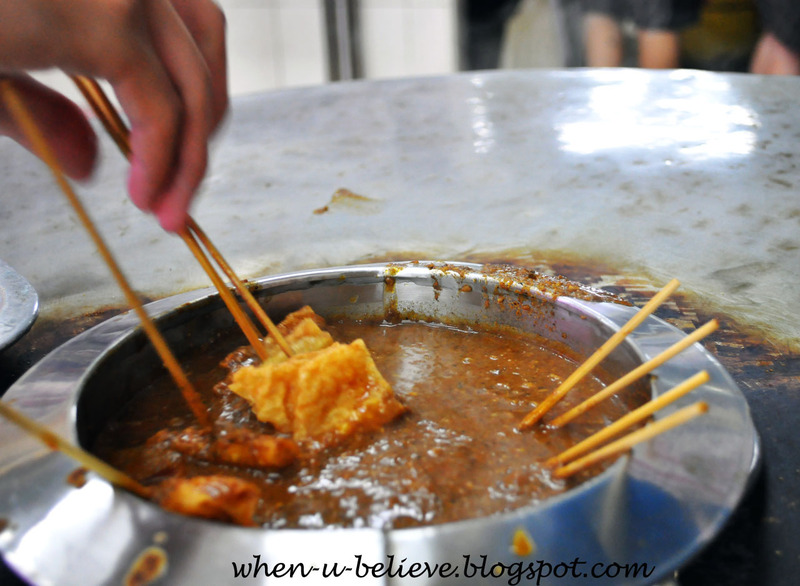 Nevertheless, most locals think that it is not spicy after all. It adds flavour to the noodles and soup. 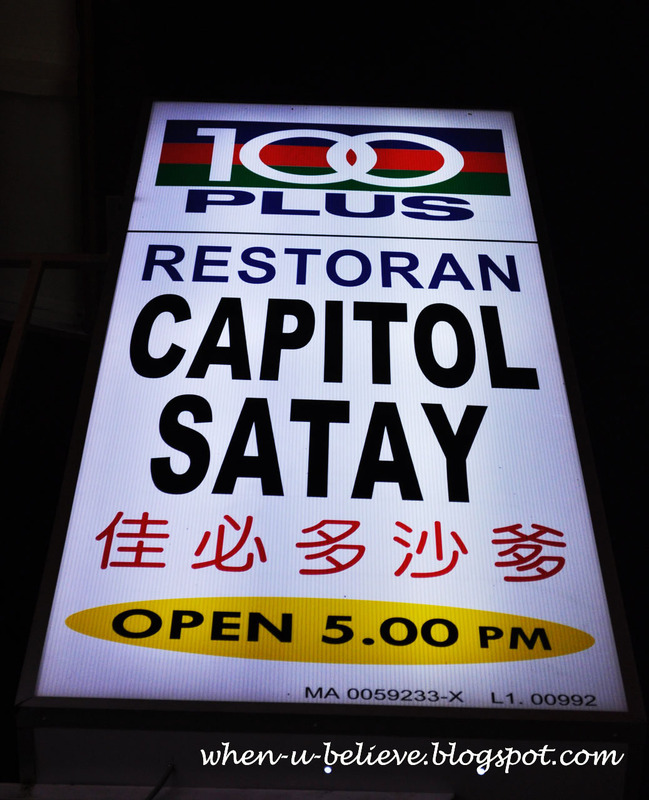 During the night, we went to the famous Satay Capitol. It is often crowded especially during the weekends where poeple from all over Malaysia as well as tourists from Singapore and Europe flock to the restaurant. 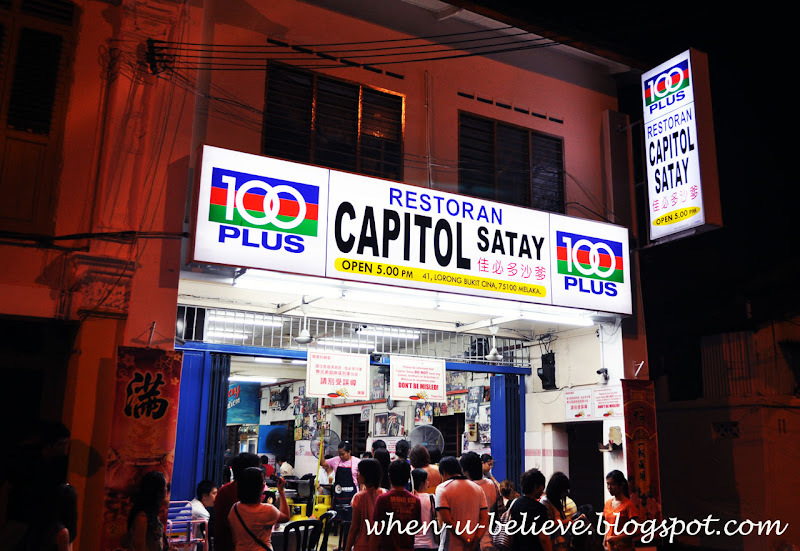 I found some European backpackers on holiday to Langkawi and had dropped by Malacca to try this gastronomical delight. They said they found out about it in the Food Guide Book. We started queing around 6 pm and had managed to get a place in the restaurant at around 7.30 pm. Considered lucky and pretty fast actually!! Sometimes you may not even get a place. Beware of imposters!! Shop owner reminding visitors that they are the only restaurant and there's no other branches!! Authentic and one of its kind, the original restaurant owner (Maybe grandpa or great grandpa of today's owner?) was the founder of this special cuisine. It had been more than 3 generations of family business . 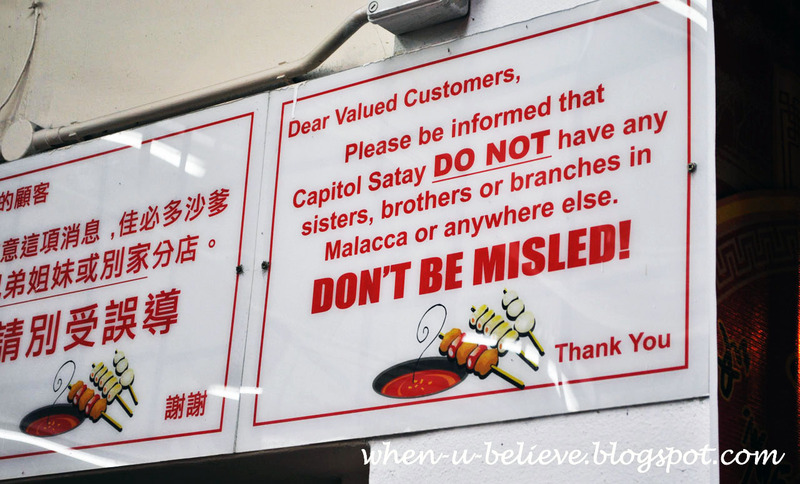 Nevertheless, there are no branch in Malacca or anywhere else. 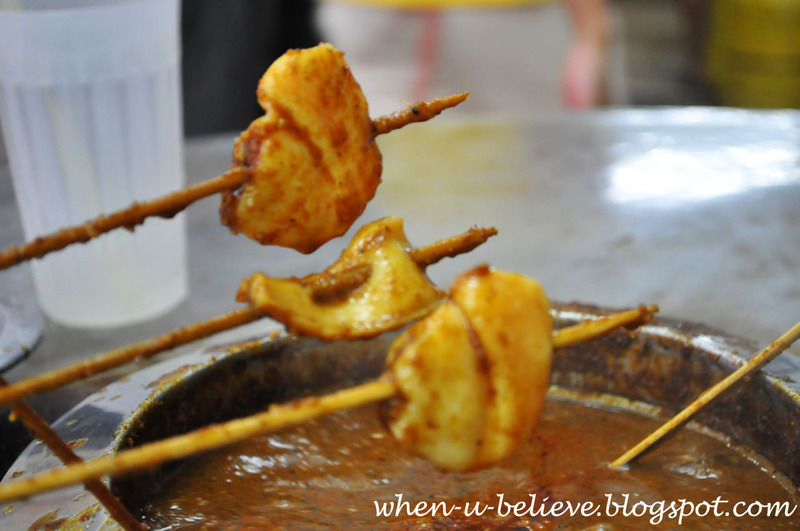 What is so special about this cuisine lies in the gravy. 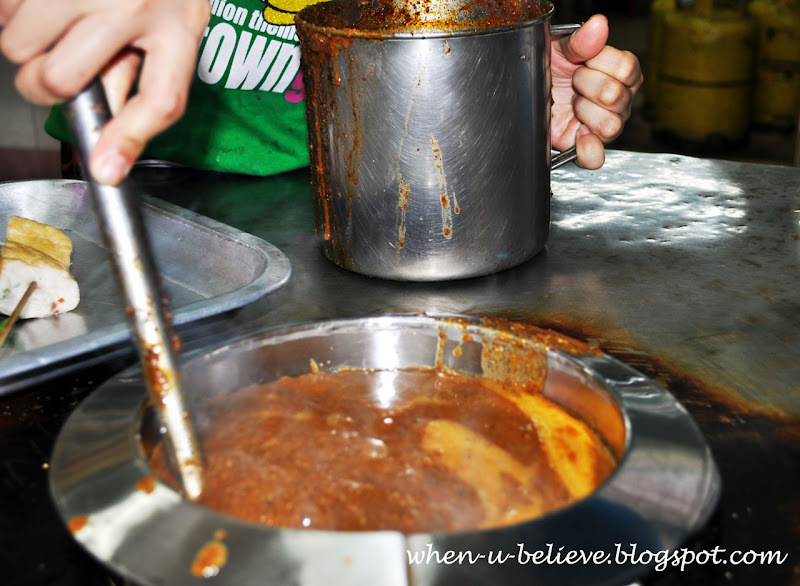 It is a special sause made of peanuts and other flavourings (not sure, secret recipe of the owner). After we were seated, the worker prepared the pots and poured in the sause. When the time was just right, other ingredients and peanuts were added into the sause. While waiting for the gravy to boil, we went to get our selections. 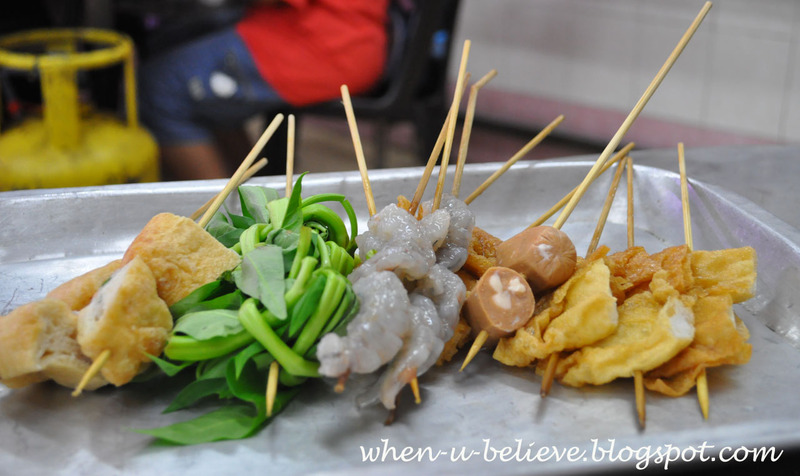 There are many choices available, mostly of fishballs, dices of meat, sausages. All ingredients are very fresh. These are inserted into sticks. Our favourite! MYR 80 cents (RM 0.80) per stick for all types. Those in plates are slightly more expensive, around RM 3-5. In Asian countries especially the Chinese community, they always believe in Yin and Yang balance. 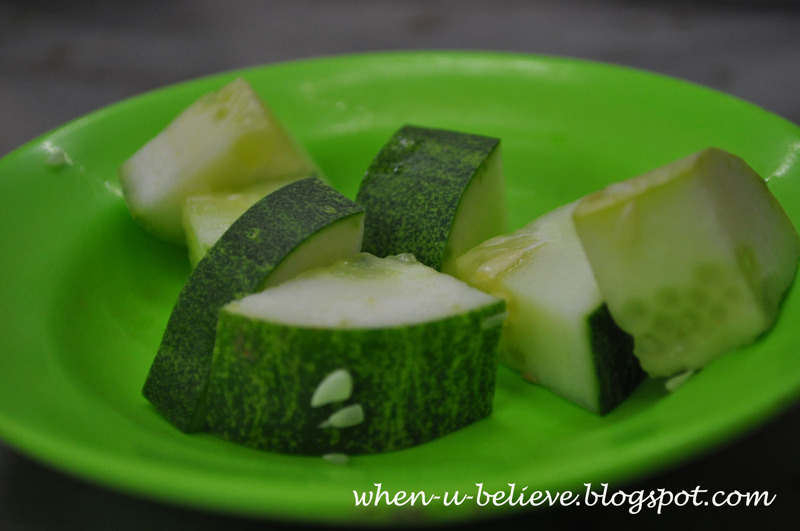 Therefore, because the sause may be heaty, so the owner provided customers some cucumbers to cool down our system. After the sause is boiled, put your choices of sticks in and wait till it is cooked. Usually, towards the end of your meal the owner will offer you these delicious abalone, prawns and seafood at the same price of MYR 80 cents. The owner greeted us and we had a short chat. He was very kind and friendly. He gave us some specially brewed coffee of his own collection. That was sometimes New, a very aromatic coffee indeed. For those who had never tried, it is definetely something not to be missed. This is my post for Thursday Challenge for Fun and Learning: "FOOD" (Meals, Restaurants, Eating, Vegetables, Unusual Foods, Cooking, BBQs,...). For more posts and food around the world click here. Must be finger and stick licking good too! that was a deliciously yummy post!!!! Looks so delicious !!!!! I would like to taste everything ! I like Asian food very much. My hubby's been there and done that, but when he was actually there, the hygiene gave him some cause for pause... food was delicious though! 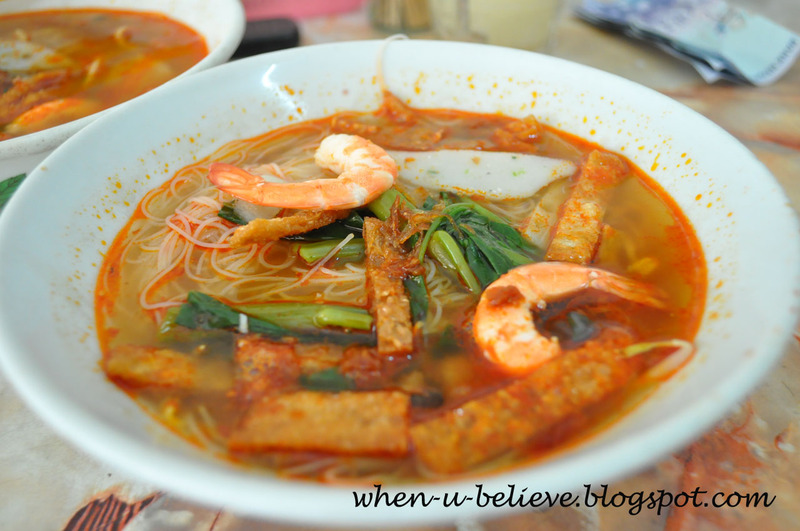 That top bowl of prawn noodles look so great!! Made me hungry. I specially like prawns but all are yummy. Hmmmn. The food looks delicious. Thanks for your visit to my blog. Yummy! the Prawn noodles looks extremely pleasing to my taste. Have a nice weekend. did you go to the Portuguese village? Great shots of the food and preparation. Okay, now I'm hungry.